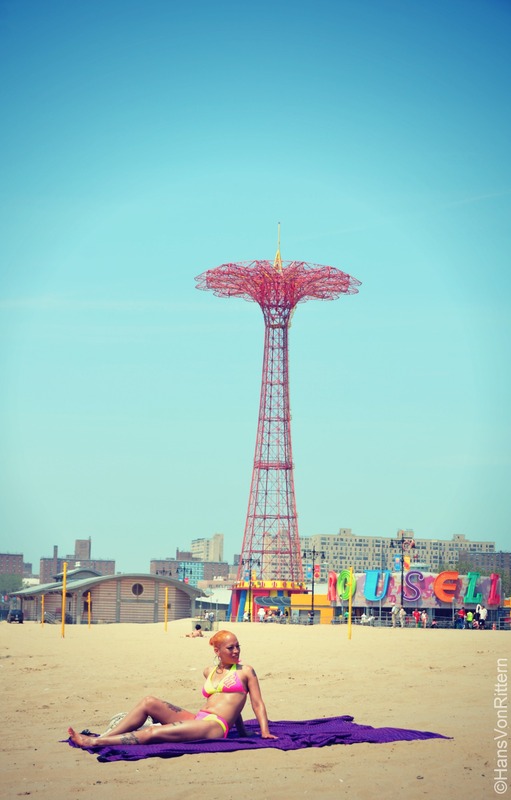 Photo of the day: GOLDEN GIRL WITH PARACHUTE – Brooklyn’s Eiffel Tower ‘The Parachute Jump’ has been towering 250 feet over the seashore since 1941. It was built for the 1939 York World’s New Fair in Flushing Meadows, Queens and was moved to Coney Island in 1941 as part of the famed Steeplechase Pier. The ride ceased operations in 1964 when the park shut down for good. Today it is the only remnant of that bygone era. What has not changed, despite hurricane Sandy, is the tradition is basking in the sun on a hot summer’s day, sitting not too far away from the famed Nathan’s hot dog stand. Life will always be a beach and a boardwalk – the amusement park, the smell of Coppertone, sand between your toes, sounds of children splashing with delight in the water, beach umbrella hawkers and young men perusing the boardwalk for their golden girl. This entry was posted on June 26, 2013 by newyorkcityinthewitofaneye. It was filed under DAILY PHOTOS WITH STORIES OF NEW YORK CITY and was tagged with 'The Parachute Jump', 1939, 1939 York World's New Fair, 1941 1964, basking in the sun, bathing beauty, Brooklyn, Brooklyn's Eiffel Tower, Carousell, Coney Island, Coppertone, Flushing Meadows Queens, girl in bikini, golden girl, Hans Von Rittern, Hurricane Sandy, Nathan's hot dog stand, New York City, New York photo, Parachute Jump, Photo of the day, pin up girl, pinnup, Steeplechase Pier, tattooed girl.